ShopWildThings offers LED Spheres, Orbs, and Balls in a variety of styles! Our Color Changing Rainbow Orbs come in sizes from Tiny Fairy Berries to Large Waterproof Orbs that are 10" in diameter. ShopWildThings also offers color changing LED Snowball is perfect for placing inside of your centerpieces for a fun new look that will be so eye-catching! Make sure to check out the short video on that page. Our new Sparkle Orbs are battery operated and have a timer, too! These are fabulous for both home use and for your events and parties where you'd love to have some fun and bright lights without breaking the budget. ShopWildThings has it all! Our LED Round Orb Globe string lights are a popular option both indoors and out. 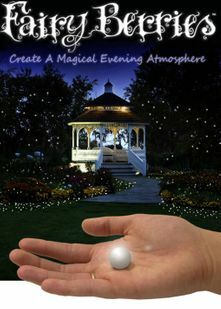 Create a space that's absolutely magical using our low-voltage, cool-to-the-touch LED Lighting. We'd love to help you tie your event decor together so please give us a call if we can answer any questions for you. The ShopWildThings staff is always eager to please and help you find the right products at the right price. String Lights - 100 Large Round LED Bulbs - White "Fairy Lights"